There will be four club runs in 2019. 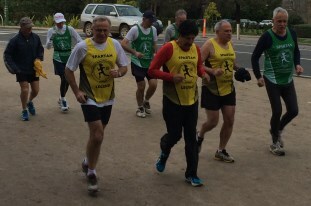 They will start at 8am on Sunday and we will meet on the track near the observatory, opposite the Shrine, in Birdwood Avenue. We will run/jog/walk a lap or two of the Tan. Afterwards we can have a coffee or snack at Jardin Tan. 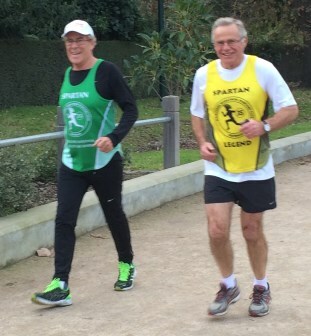 Please wear your Spartan singlets so we can make a show. Parking is free on Sundays. We will run clockwise (up Anderson St hill) so if you arrive late, run in the other direction and you should meet up with a group. 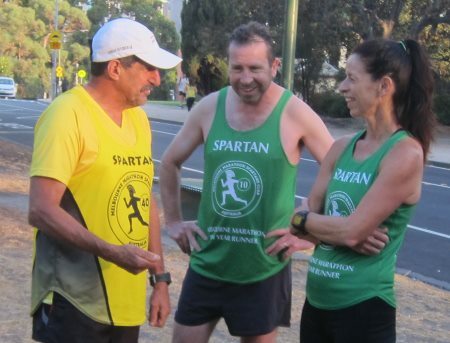 These runs are social events as much as an opportunity to stretch your legs since we normally end up in small groups scattered widely on the track. The last group is typically chronologically challenged and proceeds at a leisurely pace. 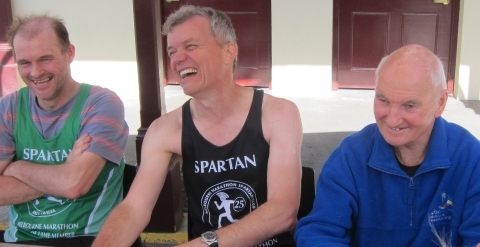 These events are open to Spartans, prospective Spartans and friends. If it so happens that one of these dates conflicts with an event that closes off the Tan, we will reschedule. 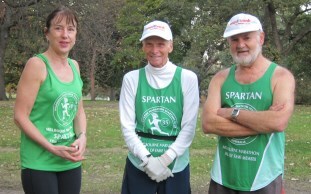 There will always be an email a week or so before the run to remind members. Rear: Bryan Flegg, Peter Seal, Pamela Young, Justin Hansen, David Foskey, Jay Fleming, Peter Gilbert, Frank Biviano, Andrew Mott. Kneeling: Rose Parente, John Dobson, Cathy Roberts. Absent from photo: Ken Miller. 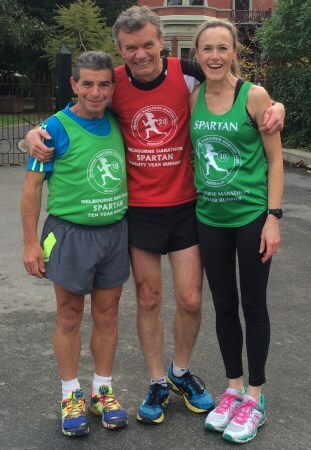 Frank Biviano, Stephen Gilbert and Cathy Roberts chatting before the run. Thunder, lightning and heavy rain at 3am did not augur well for a successful club run. 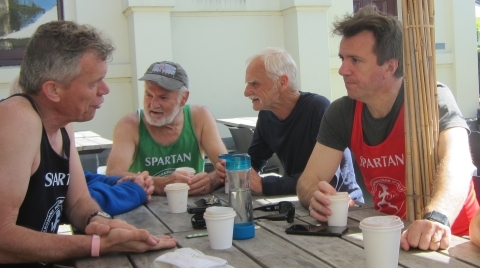 However, the morning was clear, the sun appeared and 15 Spartans enjoyed a pleasant run followed by light refreshments at Jardin Tan. 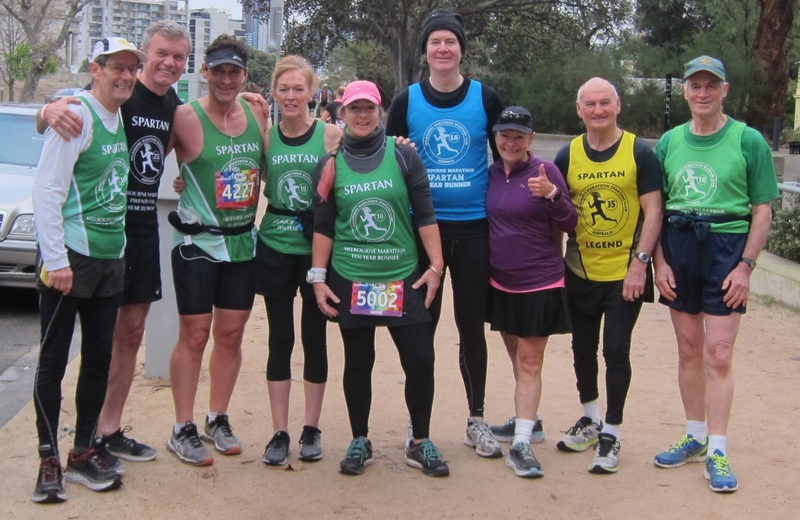 Jay Fleming, Vilim Podreka, John Cunningham, Tony Martin, Andrew Mott, Bryan Flegg, Brian Walsh, Len Hallett, Steven Lightowler, Candida Baskcomb, David Foskey. 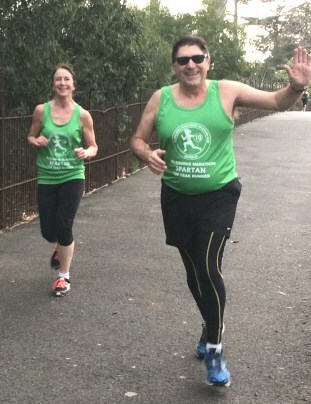 David and Candida are wearing the new Spartan buffs, however, this isn’t the recommended mode. Bryan Flegg in the lead, Brian Walsh and John Adams in the group following, Peter Ryan and Frank Biviano at the rear. 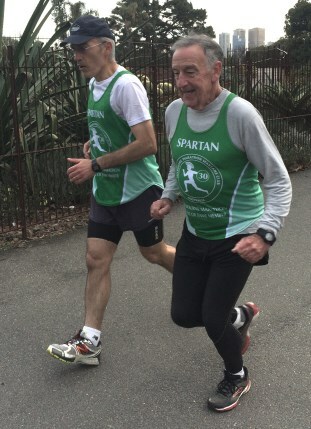 15 Spartans met at the Albert Park Carousel on a cold and windy day. 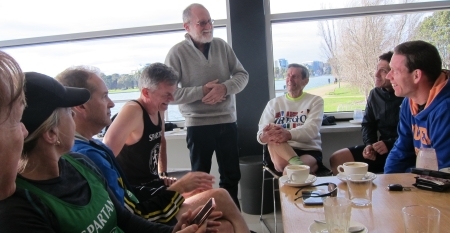 Small groups each ran a lap at widely varying speeds, afterwards meeting inside for refreshments. 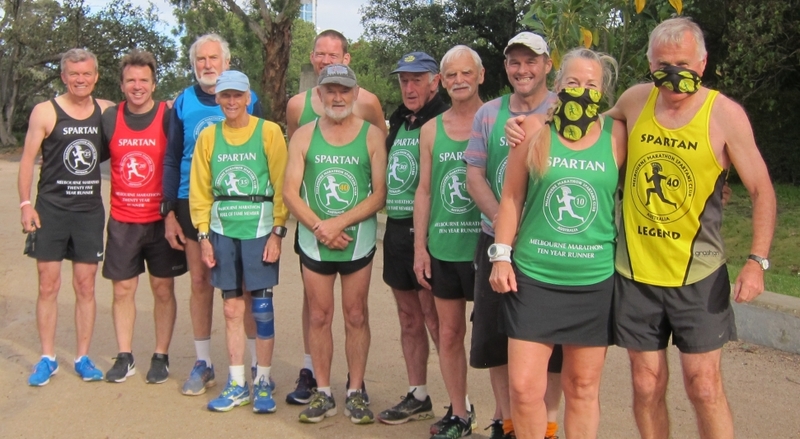 The collage above shows, at left, Nev Gardner and Bruce Hargreaves at today’s run, centre shows Bruce (far left) and Nev (far right) during the 1978 Marathon and at right we see the same two gentlemen at the 2017 Annual General Meeting. We intend to set up a formal Club Run schedule for 2019 which will be published here and in Newsletters. Clear skies and no wind greeted us on a day ideal for running. 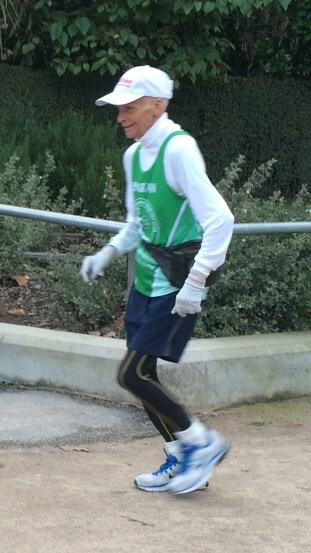 Due to the failure of the organiser of the run to check the race calendar, we shared the Tan with the “Tan Ultra”. 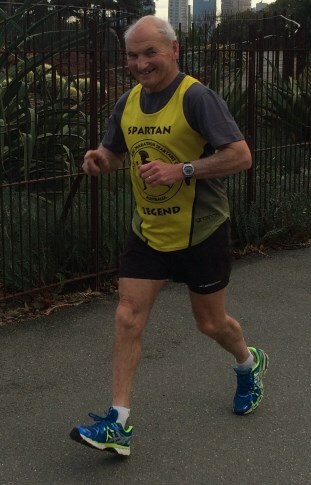 However, we were able to see several Spartans as they went past on one of their several laps. 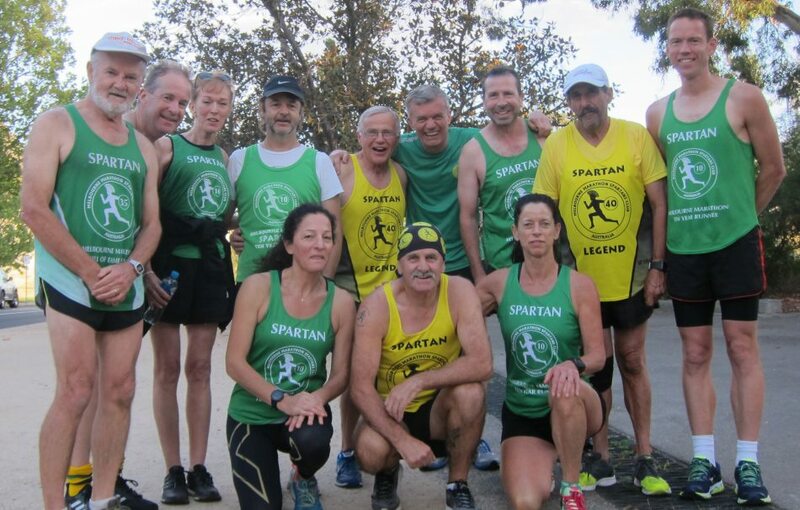 Candida Bascomb (50k), Jane Sturzaker(42k), and John Kaparelis(42k) took enough of a break to join us in the photo below. John Dean, Jay Fleming, John Kaparelis, Pamela Young, Candida Bascomb, Steve Miller, Jane Sturzaker, Nev Gardner, Ken Miller. Missing from photo: David Foskey. After our one or two laps, we shared an outside table at Jardin Tan where Felicity Doolan joined us for a chat and a coffee. 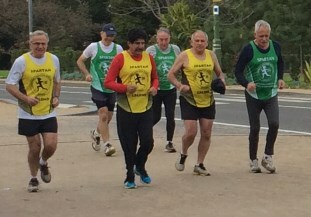 A small group enjoyed a lap or two of the Tan, at widely varying paces, in beautiful autumn weather. 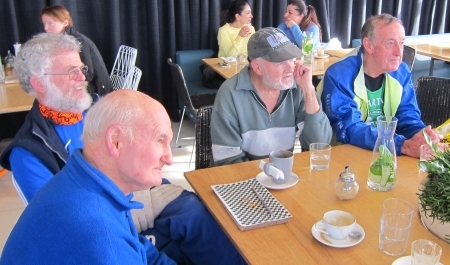 Afterwards we gathered around an outside table of Jardin Tan for a chat and a coffee. We will do it again in a month or so. 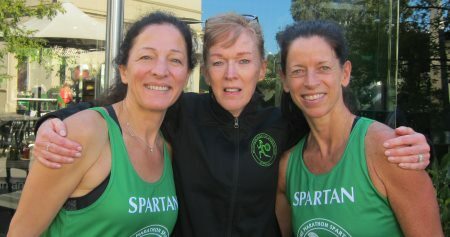 Pamela has requested that more female Spartans attend! 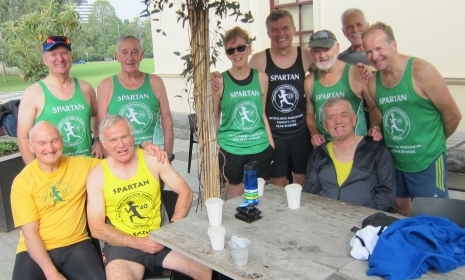 Before setting off: Peter Seal, Brian Walsh, Dennis Nish, Bryan Flegg, Jay Fleming, Nev Gardner, Frank Biviano, Pamela Young, David Foskey, Tony Martin, Frank Pupic. Ian Gainey missed being in this photo. 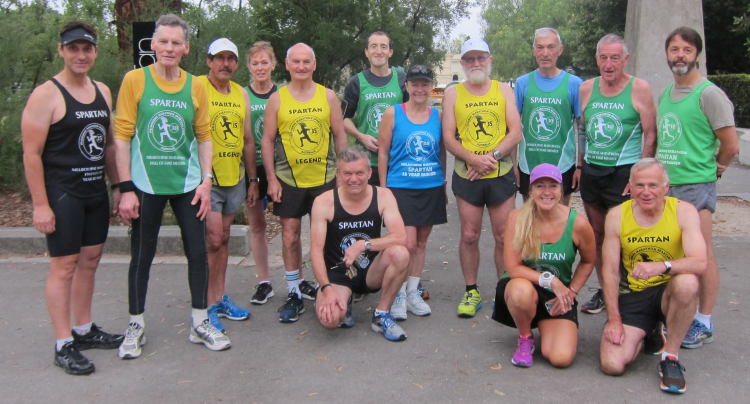 A select group of runners braved the inclement conditions for a run on the 23rd of July. Bryan Flegg, John Dobson, John Dean, Jay Fleming, Ian Gainey, Frank Biviano, Francis Kaszmarek. 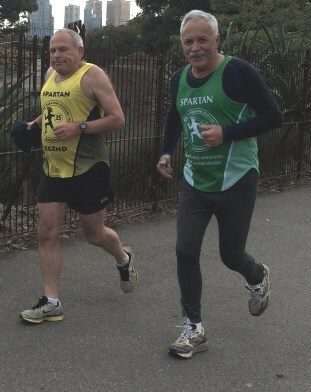 We met outside the Observatory, Birdwood Avenue at 8am and ran/jogged/walked a lap or two of the Tan. Afterwards we had a coffee or orange juice at Jardin Tan. 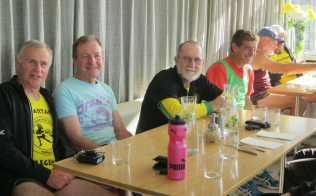 Our first club run for 2015 attracted 17 runners who did one or two laps around the Tan, then adjourned to the Jardin Tan eatery for refreshments. We were very glad that we had a few members attend who aren’t (yet?) in the Hall of Fame. 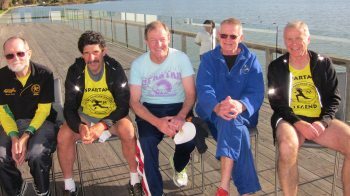 The date chosen coincided with the Gold Coast Marathon which ruled out a few potential starters. 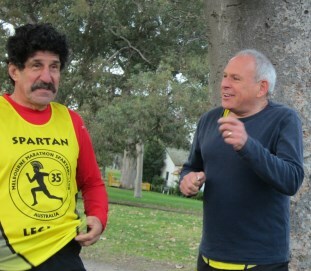 We will organise a similar run in the future. 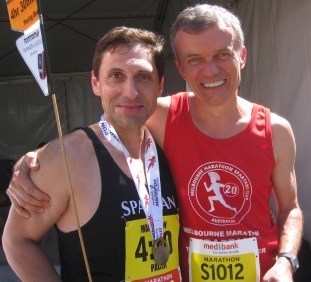 David Foskey, Nev Gardner, Cath Bombardieri, Roger Weinstein, John Dobson, Peter Ryan, Dennis Nish, Justin Hansen, Mike Zervos, Jay Fleming, Ray Cilia, Brian Walsh, Frank Biviano, Bryan Flegg, Antony Martin, Felicity Doolan, Carli Iovenitti. 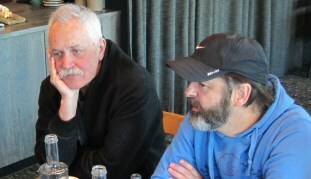 Brian Walsh, Nev Gardner and Jay Fleming. 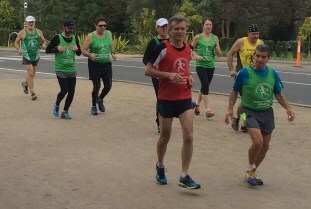 Join the Victorian Road Runners on the first Saturday of each month at the Tan, commencing at 7.30 am for a run of 4km or 8km (or more!). 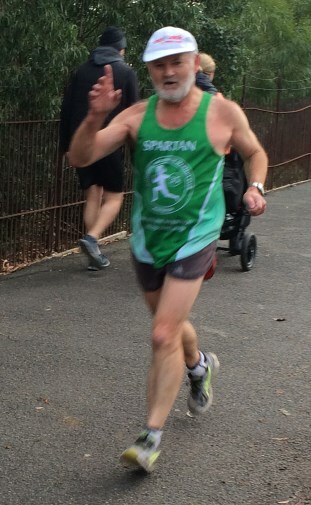 President Jay Fleming hopes to see you, in your Spartan singlet, for a lap. 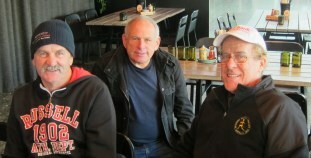 The picture shows committee member John Kaparelis on the left and President Jay Fleming on the right. A few stalwarts turned up even though the weather was less than promising. True to expectation, there were periods of heavy rain during the run, but the sun came out by the end. There was always the prospect of a warm drink in the comfort of the Observatory Cafe – alas, closed for renovations! 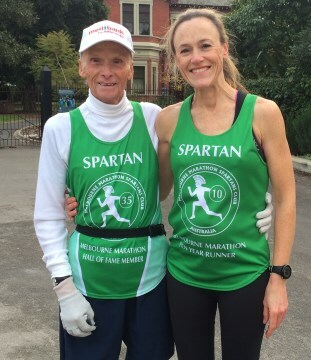 This meant that there was at least one Spartan on the Tan (running much faster than me) that I didn’t meet, so if you read this, please send an email and let me know who you are. We will organise another run: we can’t guarantee the weather, but we do promise to check whether coffee will be available. We started a little after 8:00 am on the Tan, near the Observatory Cafe. 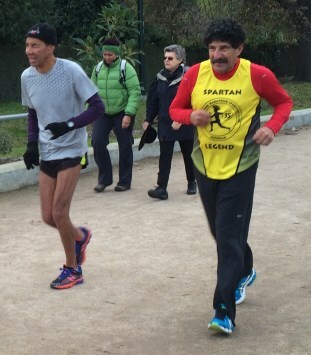 We had ten members and broke up into a number of groups according to the desired speed of the runners. One group ran a single lap at a leisurely pace. 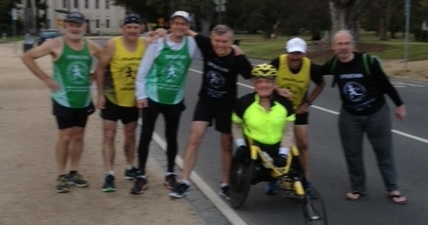 This group included Nev Gardner who was knocked off his bike by a car on New Years Day. Other groups ran two or three laps at varying paces. 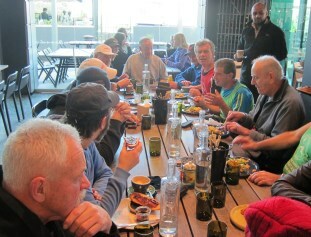 Most of us adjourned to the Observatory Cafe for a snack and a chat to round off an enjoyable morning. Starting in May, the Sunday Run is back! They commenced May 5, continuing weekly until Sunday the 30th of June which was the last in the first series. The May 19 run doubled as an opportunity to shoot some footage for a future documentary. Those who attended were treated to some marvellous weather and had an enjoyable day. We would like to thank the Carousel Cafe for reserving two tables for us on their busiest day of the year and making their deck available for filming.